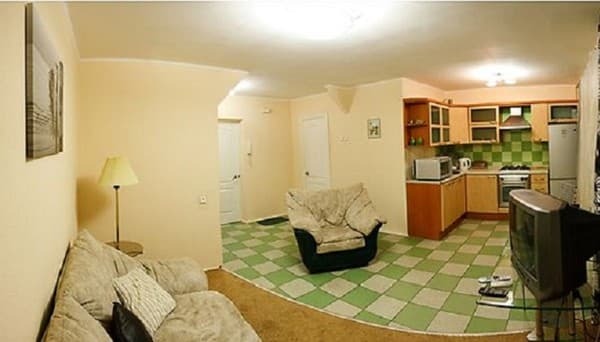 Apartments with balcony are located in the center of Kiev, in a 7-minute walk from the metro station "Dvorets Sporta". The apartments are located in the heart of the city near the main attractions of Kiev, including St. Sophia Cathedral, which is less than a 20-minute walk away. The main street Khreshchatyk can be reached in 15 minutes. The apartments are located on the 7th floor of the house. A balcony offers wonderful views of the city. Free WI-FI is available. The fully equipped kitchen has a dining area and oven, so you can prepare a meal to your own taste. Distance to the train station is 40 km, to the airport - 34 km. You can get keys to the apartment at Lesya Ukrainka Boulevard (21st office). 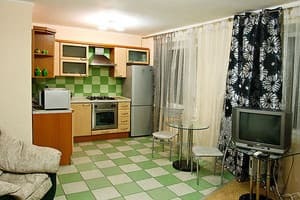 Description of the room: Cozy two-room apartment with an area of ​​80 sq. M. In the bathroom - corner curly bath. Apartments are located in the center of Kiev, in a 7-minute walk from the metro station "Dvorets Sporta". Distance to the train station is 40 km, to the airport - 34 km.